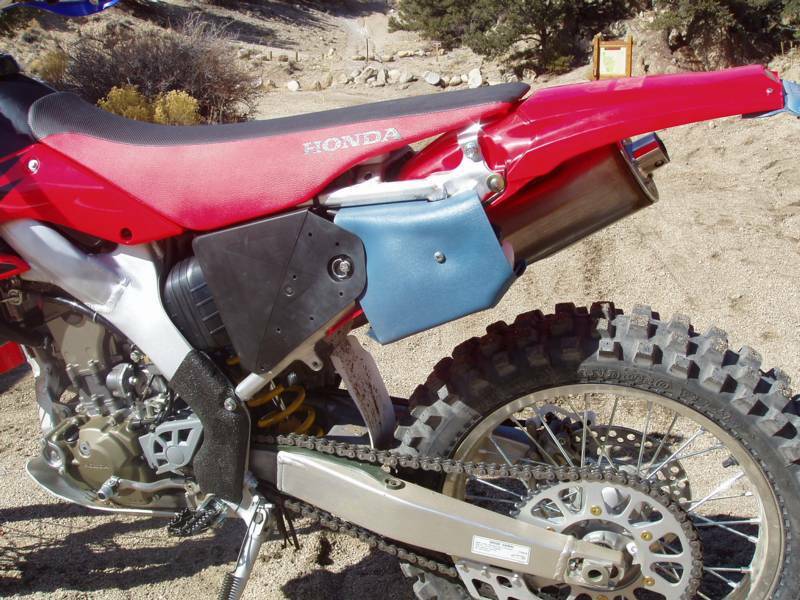 I modified my 250X in a vain attempt to improve upon Honda's design, always telling myself that my mods were just personal preference. In reality, I was gratifying my urge to express a rather mediocre engineering skill. Over the years, mods came and went, and this page represents the 250X as sold in July, 2017. The mods are in alphabetical order, not in the order I did them. The picture of the airbox below shows the cast-in 'raised cut line' as described in the "Closed Course Competition Modifications" bulletin (click to supersize). I have drawn in a red line along part of the cut line to show where the line goes; it's much clearer when you see it yourself. I cut out some of the air box top (3 1/2 x 3 1/2) but not as much as described in the CCC bulletin (4 x 7); see my cuts in the lower picture. 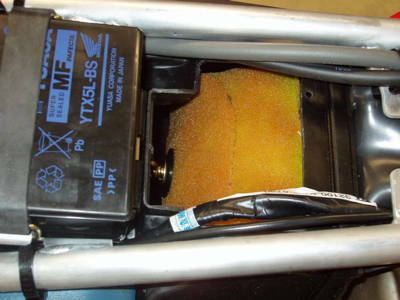 I also removed the wire screen in the filter cage, but others who did dyno testing have shown that removal of the screen does nothing for performance. 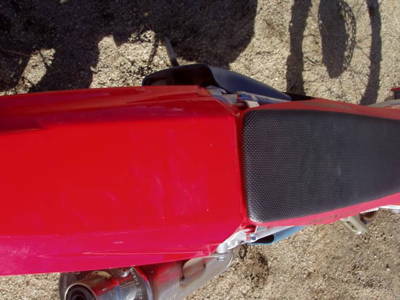 Note: On my way to getting the air box out of the frame, I discovered the joys of sub-frames. I've never owned a bike with a sub-frame, and I never knew what I was missing. I had to raise the sub-frame to get the airbox out. The Service Manual says to remove the muffler from the exhaust header when you're removing or pivoting the sub-frame. I didn't want to take a chance on ruining the gasket where the two join, so I left them connected and, after removing the muffler mounting bolts, I strung a wire to hang the muffler from my garage door opener hanger bracket. 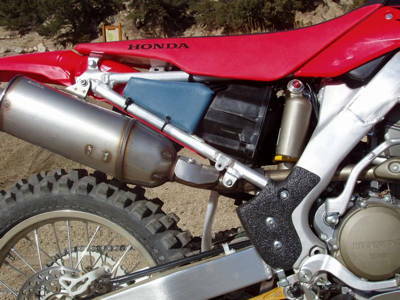 The muffler hangs while remaining connected to the exhaust header pipe and the sub-frame pivots and comes off easily. 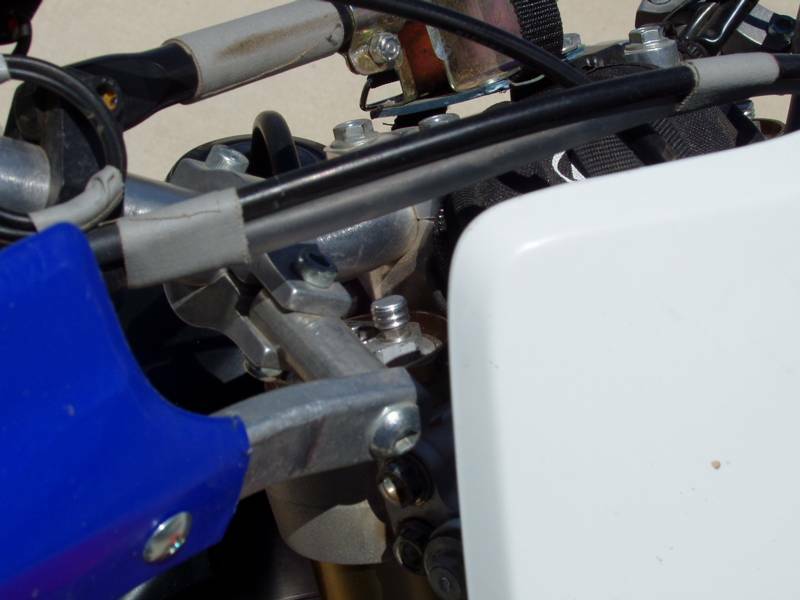 When I lowered the triple clamps and shortened the handlebars, the front brake line looped high above the handlebars, so I replaced it with the CRF250R front brake line; it's a perfect fit. In the picture below, I have temporarily mounted the longer X brake line alongside the R brake line to show how much higher the X brake line loops up. The R brake line has the two pieces of gray tape wrapped around it, taping the odometer wire (since removed) and brake line together. 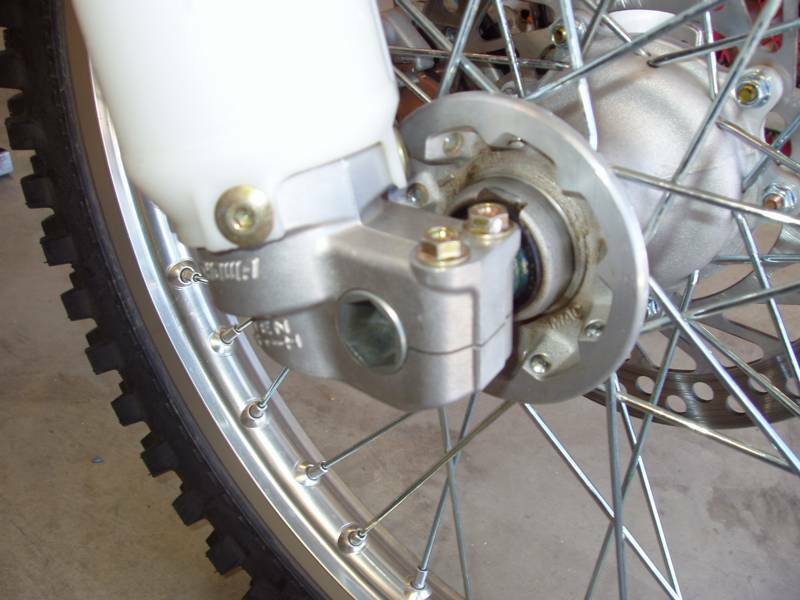 The X brake line is about 6.25" longer than the R brake line. Notice that I don't have an odometer or other gear in the middle of the area that the brake line passes over. If you use the stock odometer, it may get in the way. I replaced five carburetor float bowl phillips screws with stainless steel hex-head screws (allen-head). That way, I only had to deal with getting the phillips screws out once (I usually bung them up). 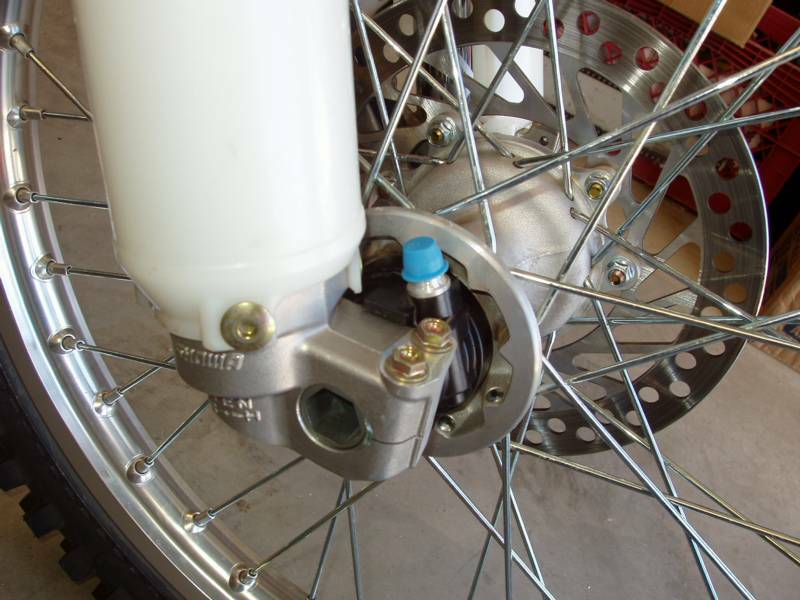 Another benefit is that you can actually remove the float bowl without taking the carb off the bike because the hex-head screws can be removed with an angled wrench after tipping the carb sideways. I did not replace the accelerator pump screws. 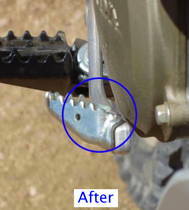 Idle-adjust bracket - replace stock screw with M4x10 and M4 lock washer. Float bowl - replace four stock M4x14 screws with M4x16 screws (no one seems to stock the M4x14 in stainless) plus M4 lock washers. If you don't use lock washers, one of the M4x16s will not fit; use an M4x12 instead. 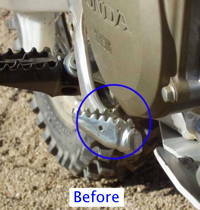 A 250X rider fell over and ended up with a hole in the clutch cover. The culprit: the brake pedal serrations. So I decided to grind a few teeth off my brake pedal. I spent quite a bit of time looking for clutch and ignition cover protectors. 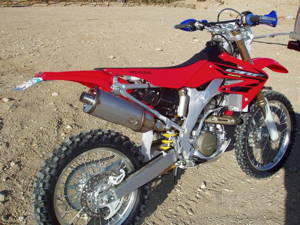 One company makes them for DRZs and a few other bikes, but no one makes anything for the CRFs. So I went looking for a replacement clutch cover. After looking at the SFB, Hinson, and Rekluse aluminum clutch covers and the Lightspeed carbon fiber clutch cover, I decided to go with the SFB. The new cover is larger and heavier than stock, but the added protection is reassuring. I installed the absolute minimum amount of equipment that I could get by with and still be street legal (after all, I did sign the affidavit!). The PIAA bulb and StonGard Headlight Shield are not legally required, but they are very valuable additions for safety and protection. The first item is a high-low beam switch for the head light. The stock bulb is a dual filament bulb; all you need to add is a switch and extra wires. Use a small, center-off toggle switch and you'll have off, low, and high. Radio Shack 275-325, about $4. I stumbled upon a great item one night while cruising eBay - extreme white, low-wattage headlight bulbs made by PIAA. These very trick bulbs are ultra bright and draw very low current, about the same as a stock bulb (2.9 amp). This 35W/35W H6M bulb fits the stock socket. Although this bulb is not required for licensing the bike, it is a welcome addition if you plan to ride at night. 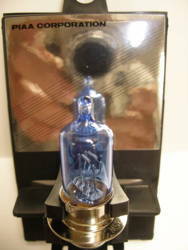 PIAA bulbs are sold on eBay for about $29.00 each, sold 2 at a time only. Chaparral has them for $27, sold individually. CRFsOnly has them for about $29 each. The pictures don't show the intensity of the PIAA bulb so well, but they are bright white! If you're going to spend all that money on a PIAA bulb, you might as well protect it. 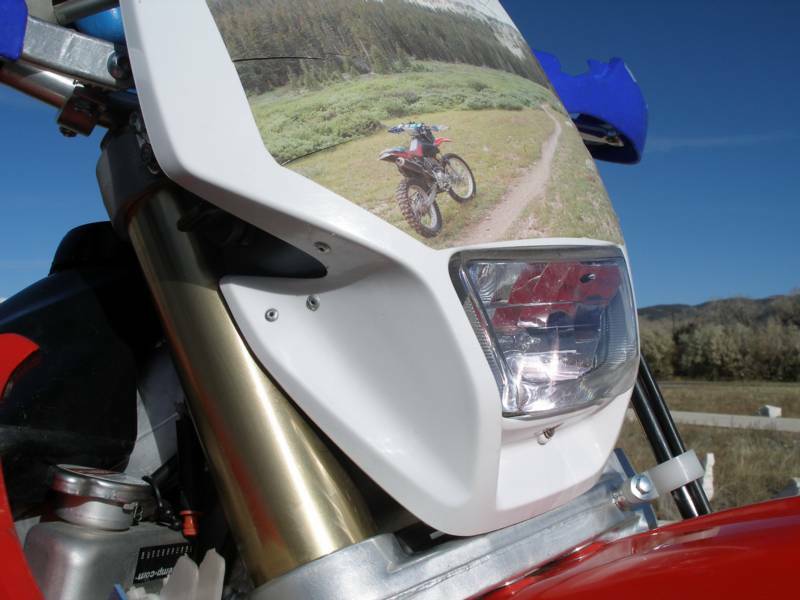 Aerostich sells the StonGard Headlight Shield, a 12" x 12" sheet of 80 mil thick clear vinyl from which you can cut a piece to fit the headlight lens. You have to look carefully at the pictures to see the protector. Part number 3569, about $18, but you'll have a lifetime supply! NOTE: this material should not be used on headlight lenses smaller than 5" with over 80W bulbs; a thermal crack may ensue. 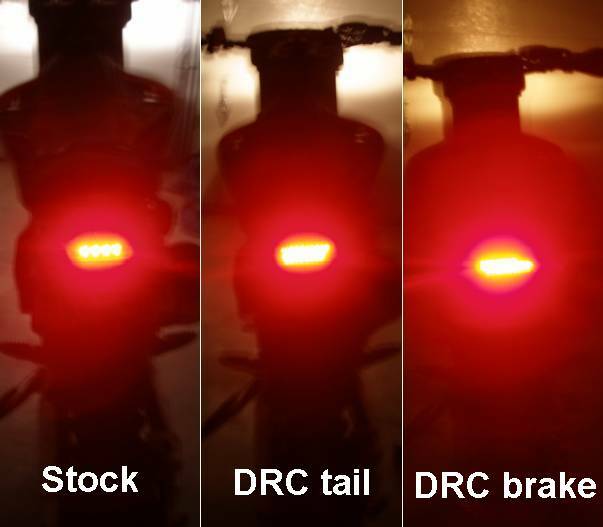 DRC makes a direct bolt-on replacement for the stock LED taillight. The DRC light looks exactly like the stocker, except for a missing foam strip. The DRC is brighter, draws less current, and includes a brakelight lead. 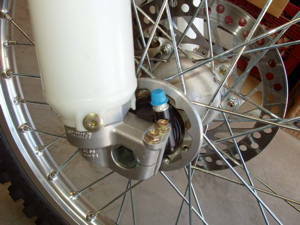 Adding a rear hydraulic brakelight switch makes the package almost complete. The only thing missing is the white license plate light, but I don't think anyone will notice. DRC products are sold by MXSouth and CRFsOnly. 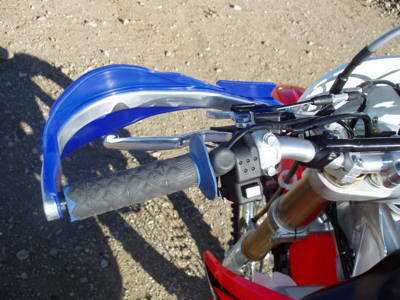 Many riders use squeeze bulb horns, but I wanted something tricker. I finally found a battery powered unit sold at bicycle shops. This horn is loud (105 db) and weighs about 3 oz, not including the 9v battery. At 1.5" x 2.5" x 2.75", the horn is not small, but I found just the right spot to mount it. I got my horn at Sunrise Cyclery for about $24.98, free shipping. My thumb is on the horn button; my finger is resting on the horn itself. I installed a small Acerbis fold-away mirror. 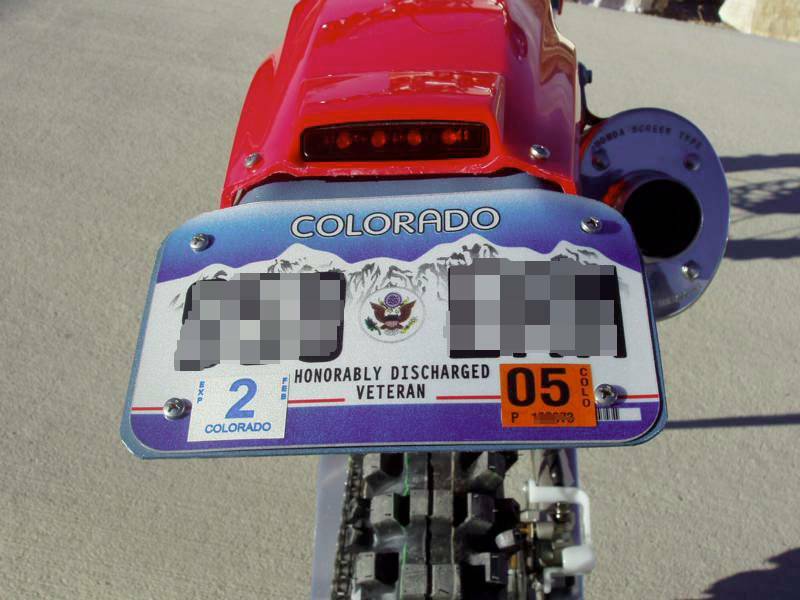 I made a mount for the license plate. I decided it would look best if the plate was just below the led taillight, so I trimmed the rear fender. I think it came out ok. I mounted some rear fender flares to keep mud off my backside. The exhaust was way too noisy with the exhaust diffuser removed and too restrictive with it installed. I modified the exhaust diffuser by drilling an 11/16" hole in the inboard end. The exhaust now has a pleasant note but is still very quiet. Remove the torx bolt at the rear of the muffler to remove the diffuser. 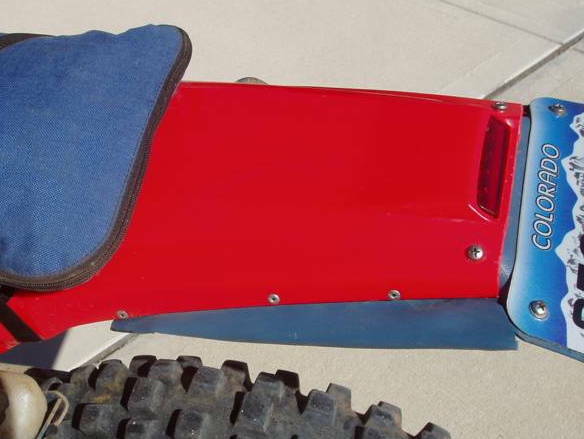 The diffuser shown fits the '04-'07 muffler; the '08 and newer diffuser is welded in. I trimmed a set of Pro Taper standard diameter CR-mid handlebars and installed new Spider SLX grips (from BRP) on the handlebars and throttle tube, then swapped out the Renthals for the shiny aluminum Pro Taper SEs. The Spider SLX grips have a soft outer layer and are smaller in diameter and slightly longer than the Honda grips. I trimmed the ends to shorten the grip slightly (usually I keep the donut ends and just cut out the centers). 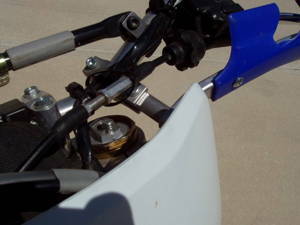 The Wacker handguards went on easily. I didn't have to cut off the levers. I swapped the start button to the left side, just like my 230F. The wires are just long enough to reach behind the headlight where they connect into the wiring harness. For my first effort to lower the seat height, I installed a Kouba Link to lower the rear of the bike 1.75". I also lowered the front: I added washers to the handlebar clamp mounts to raise the handlebars, and then I lowered the triple clamp 3/4 inch below the top of the upper fork tubes. 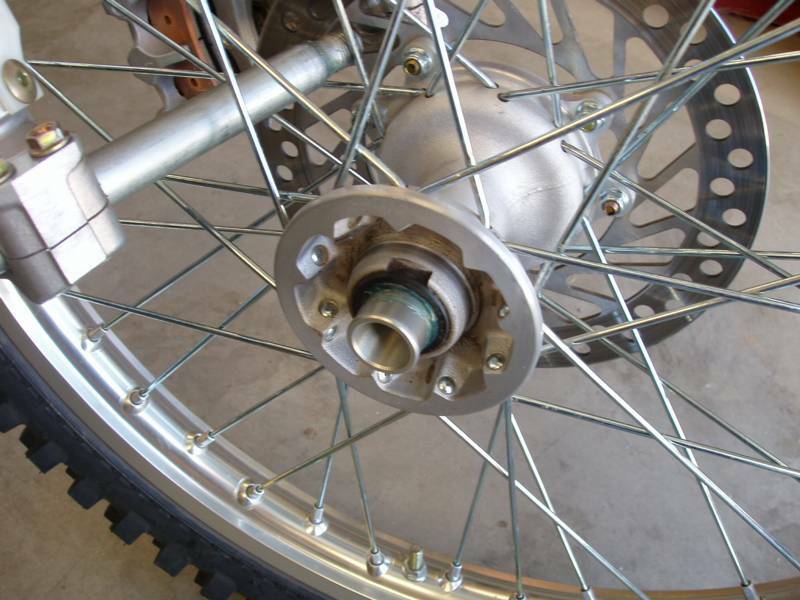 When I did this, I noticed that the upper fork clamp bolts were lower than the inside threaded portion of the fork where the damper assembly screws in. So, I used the same torque as for the lower clamp bolts, 14 lb-ft. Both mods together resulted in the low spot in the seat dropping 1 3/4 inches. I set the rear suspension sag at 4". Eventually, I spent a tidy sum to have the forks shortened; see 'Forks - shortening' below. I think that adding more washers or a larger spacer to space the handlebars higher and allow the triple clamps to be dropped lower is a bad idea. The forks are tapered in the area between the stock clamping positions, and if you get too far away from the stock position, you'll be in the tapered area, and the triple clamps will not get a good grip on the forks. 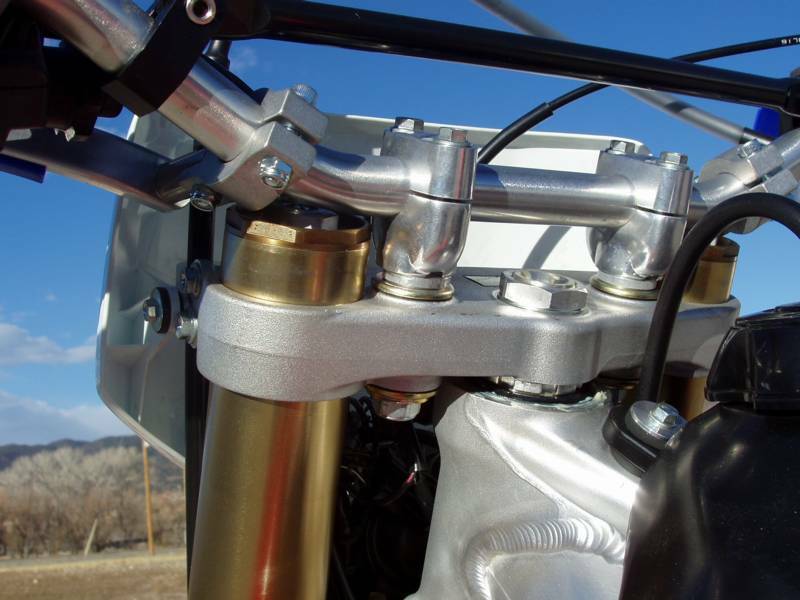 Ideally, the forks should be shortened the desired amount using an internal spacer, and then mounted in the triple clamps in the stock position. 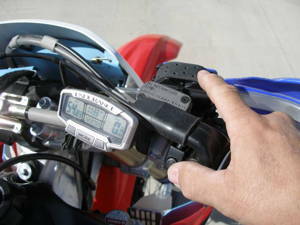 I installed the TrailTech electronic odometer and used it for several years. I removed it before I sold the bike. When I installed the TrailTech, I removed the stock mechanical odometer and the odometer cable. I covered the cable connection with a plastic cap. It looked ok.
A month later, when I changed the front tire, I promptly broke the stock mechanical sending unit. I incorrectly installed the sending unit onto the wheel hub and crushed the plastic insides when I tightened the axle nut. DUH. I pressed out the metal tube from the sending unit, so I could use it alone, without the rest of the now-broken sending unit. The tube has a cast-in 4-sided nut that promptly broke the plastic that was holding it into the sending unit when I pressed it out. No worries, the plastic was broken already. Eventually, I ordered the oil seal and collar from the left side of the wheel, and they fit correctly onto the right side of the wheel. 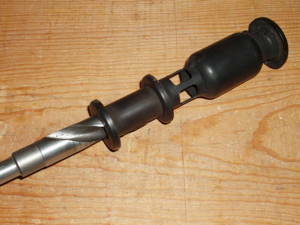 The collar is 1mm longer than the tube from the sending unit, so the axle sticks out .5mm. But that's ok.
Left side collar on the left, pressed out tube on the right. The reserve tank vent hose runs from the reserve tank to the middle of the bike and then joins other hoses to run down behind the transmission. 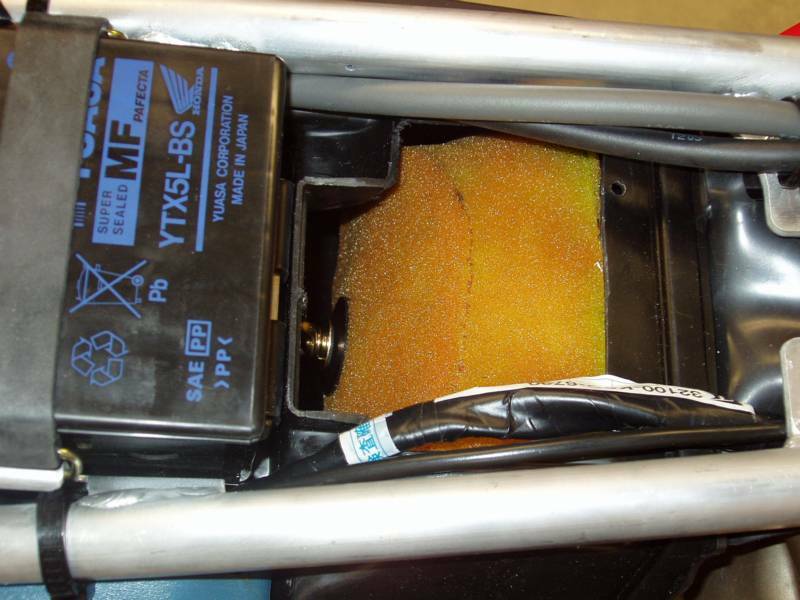 If you see excessive coolant dripping from the hose, check the reserve tank to see if it is overfilled. If the bike is hot, there may be some normal overflow; recheck the fluid level when the bike cools down. I ran this hose behind the transmission and on top of the skid plate. 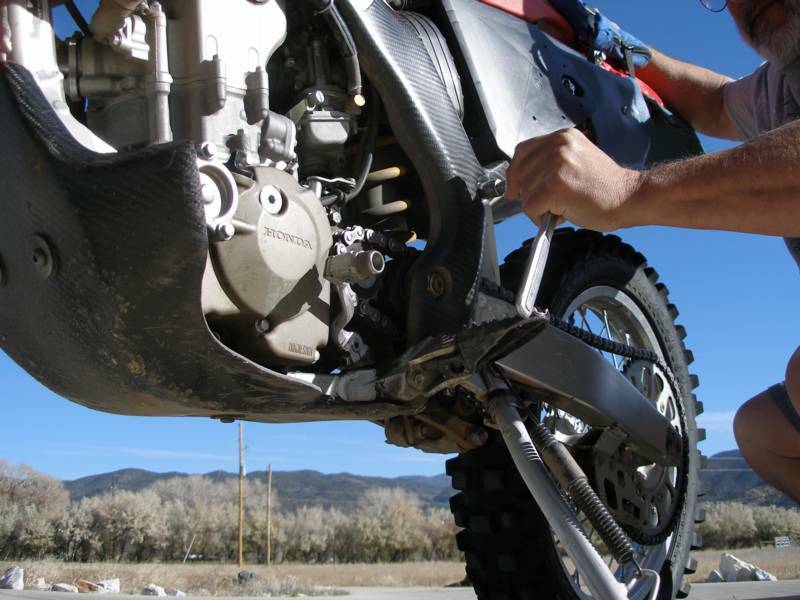 Any overflow will spill onto the skid plate and evaporate. 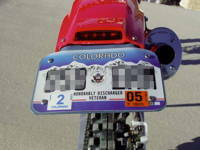 Those who know me, know that I don't like number plates on bikes that I register for street use. They make the bike stand out too much. And they don't do anything for performance. And they just cost money to replace after you fall on them. So I always take the number plates off and make replacement covers, as appropriate. The 250X didn't need much, and I think it looks ok. Sort of the 'naked bike' look of road bikes. The bike actually looks a little narrower than stock. I also removed the metal tabs on the side of the muffler. 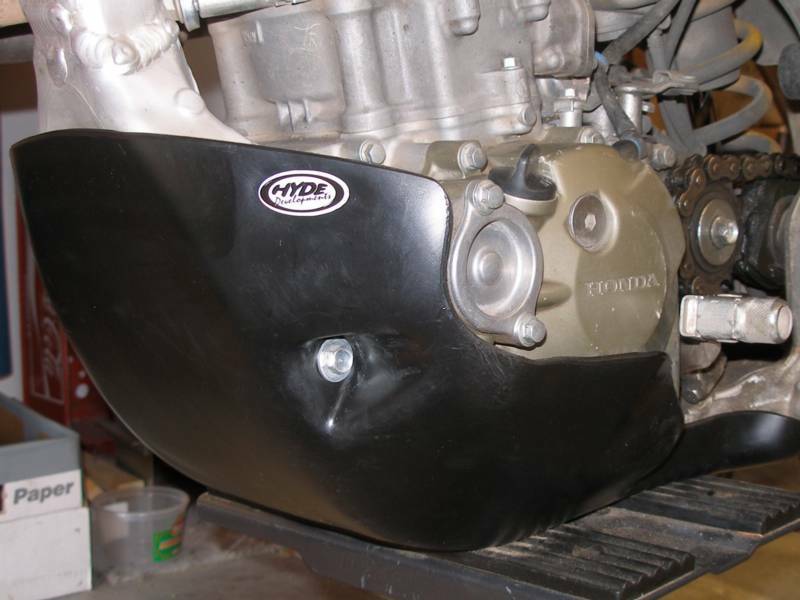 In August 2006, after installing a Hyde Racing skid plate on my CRF230F and being fairly happy with the results, I decided to get one for the 250X also. The Hyde units are made of Teflon/Co-Polymer, which they say is a form of polyethylene. They're supposed to be plenty tough, and the 230F unit has held up well so far. Mounting the 250X model was a little difficult. 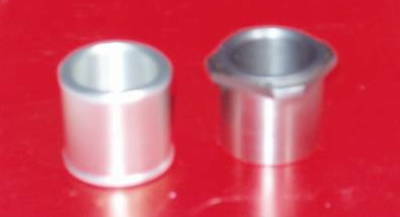 There are two mounting holes, one on each side, that line up with the stock wing guard mounting nuts. The Hyde unit is such a tight fit that I had to press rather firmly on the front and bottom of the skid plate to get the holes to line up. The left side bolt went in ok. The right side was a problem. 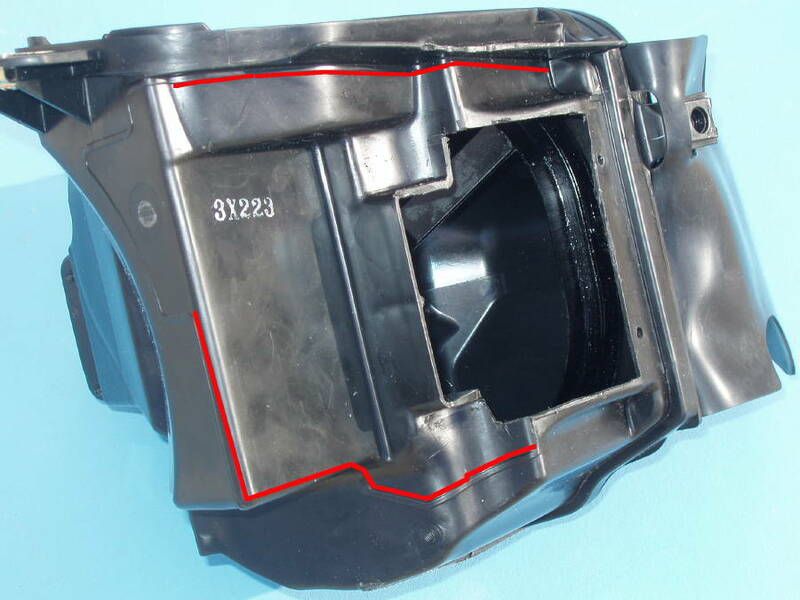 The bolt wouldn't easily enter the skid plate hole squarely and then engage the frame nut smoothly. USE YOUR FINGERS TO THREAD THE BOLT INITIALLY. If you use a ratchet or wrench, you may cross thread the nut. 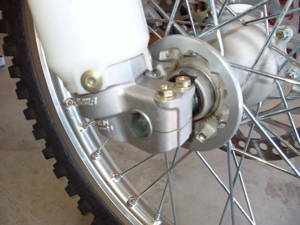 The rear bracket went on without a problem; it has two smaller bolts, and the bracket fits over the frame easily. The skid plate fits snugly with only one minor problem. There is no way to access the engine oil drain bolt and no drain holes in the skid plate, so I will have to remove it for oil servicing. It won't be too bad, there's only the rear mount and two front bolts. Piece of cake. How does it work? Excellent. The Hyde is a much closer-fitting skid plate than the E-Line unit I had installed previously. 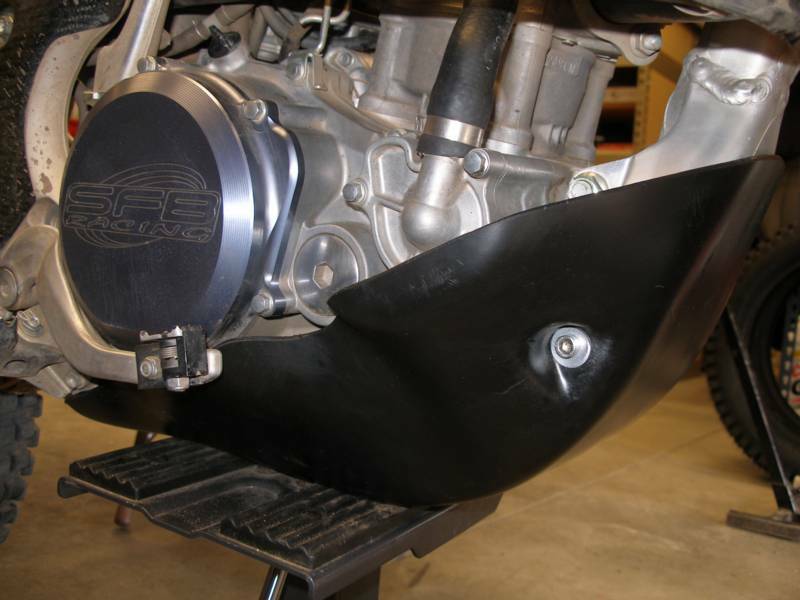 It wraps around the frame and lower engine and provides more protection than the E-Line. I liked the E-Line, but I like the Hyde better. And the Hyde is just as quiet, maybe even quieter, than the E-Line. The Hyde is 4 ounces lighter than the E-Line. BONUS! 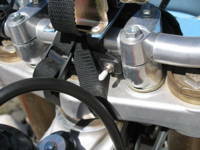 The transmission vent hose is connected to the transmission vent at the top right side of the transmission. From there it runs a short distance upwards, then branches at a T fitting. One branch runs up to and through the upper engine mount plates and is open-ended. 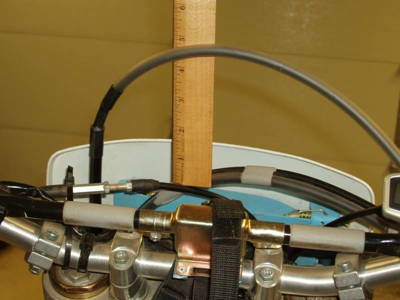 The other branch runs behind the transmission and downwards with all the other drain hoses; it is also open-ended. If you see excessive oil dripping from the lower hose, recheck the transmission oil level. I ran the lower transmission vent hose to the right side of the transmission and tucked one flap of the split end of the hose behind the spring on the rear brake pedal. 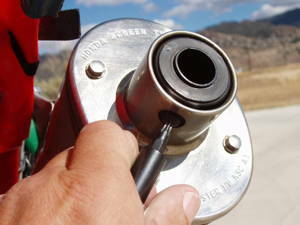 This keeps the end of the hose high and open during most water crossings.